Last month we heard that @LulzSec, the group responsible for many of the hacking attacks on a large number of sites, including Sony, had ended their hacking campaign. Now it seems that LulzSec is back, and their latest target is Rupert Murdoch’s media empire, which has come under massive criticism over the last month for the phone hacking scandal that saw Murdoch close down his most popular UK newspaper the News of the World, and LulzSec decided to hack one of Murdoch’s other publications The Sun as well as his News International website. 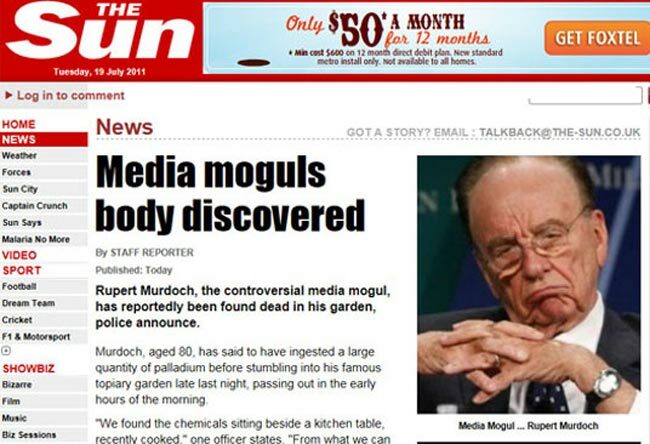 As you can see in the photo above LulzSec posted a fake story saying that Rupert Murdoch had been found dead, they then re-directed the Sun to the @LulzSec twitter account, they then leaked phone numbers of a number of the Sun and News international editors and also leaked the login information for Rebekah Brooks email address. LulzSec decided to perform their hacking of the Sun and news international the day before Rupert Murdoch and others involved in the phone hacking scandal are due to appear before MP’s here in the UK.